Lying in the north of the vast and bountiful expanse of India and cradled in the awesome beauty and calm serenity of the stately Himalayas. Sacred pilgrimages of different religions including the world famous "Char Dham " or the four Hindu pilgrimage destinations of Shri Badrinath - Kedarnath - Gangotri - Yamunotri. The sacred Sikh pilgrimage of Hemkund - Lokpal, Nanakmatta and Meetha - Reetha Sahib and Piran Kaliyar have drawn pilgrims and seekers for spiritual fulfillment to Uttaranchal. Kailsah Mansarovar, Tholingmath are all in the Chinese occupied Tibet, but for the people of yesteryears, these were some of the most important landmarks in Uttaranchal. In the north east the beautiful city named Nainital is 34 Km from Kathgodam, the gateway of Kumaon and the terminus of North Eastern Railway. It is 304 km from Delhi, capital of India, and 388 km from Lucknow. According to the District Gazetteer Nainital is situated at 29 degree 24' north latitude and 79 degree 28' east longitude, in a valley of the Gagar range running east and west, which is bounded on the north by the peak of China, which rises to a height of 8.568 feet, continued by the Alma peak (presently known as Snow-View) and the Sher-Ka-Danda to the eastern extremity, where the ridge descends almost to the level of the lake. Mussoorie is one of the major hill station of india, is located in the Garhwal hills. Due to its immense natural beauty, Mussoorie is known as the queen of hill stations. In 1820 Captain Young from the British army was influenced by the beauty of this place and made this place his residence. This marked the foundation of a hill station called Mussoorie. The name, Mussoorie, is derived from plants of 'Mussoorie' which were found in abundance here. After its discovery, this hill station gradually developed as a center of education, business, tourism and beauty. 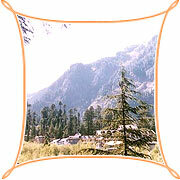 The lifeline of the hill resort of Mussoorie is undoubted ably the Mall. The Mall besides the series of shops offers wondrous vistas of the surrounding hills and the Doon Valley below. You must be at the Mall while in Mussoorie especially as the evening falls. The tourists come together to enjoy the spectacular sunset. The sunset is followed by the view of the twinkling lights that shine one by one in the valley below. You just can't skip the Kulri Bazaar and the Library Chowk of the Mall. The Kulri Bazaar offers several items of Indian fare.